11 new colors of Sari Silk Ribbon are now available! Check ‘em out. …to my new pattern available for free! 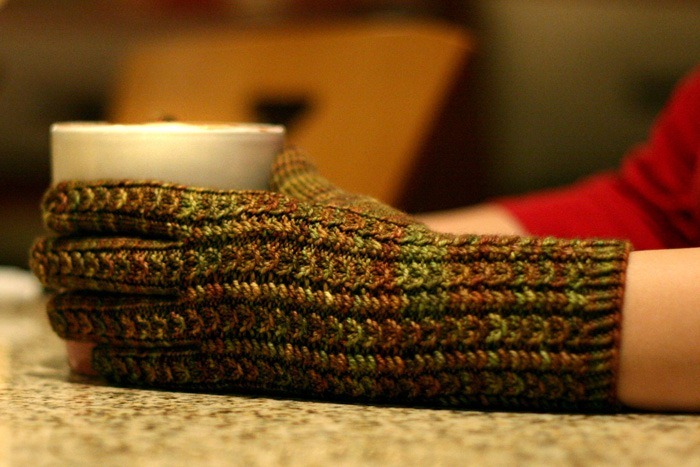 Click here to download the Froot Loop gloves pattern or click here to check it out on Ravelry. 60 hearts, 47 downloads, and 22 queues in the past 3.5 hours! You guys are making me blush. These gloves are based on the lovely Froot Loop socks by Kristi Geraci from the Sprping ‘08 issue of Knitty. Join any Gritty Knits Fiber of the Month club by January 31 and earn a chance to win DOUBLE FIBER for February. All of the GK fiber clubs are commitment-free, so you can stick around all year or just try it out for a month or two. We’ve got three clubs available: merino top, superwash merino top and novelty batt. Join the Gritty Knits Fiber Lovers group on Ravelry before March 1 and earn a chance to win one of three $10 gift certificates. I lost 30 lbs in 2010, so that’s a dollar for every glorious pound gone. Wahoo! Check out my photoblog, where I will post a picture every day in 2011. No prizes to be won here; it’s just eye candy for people who like photography. I will try to post fiber/yarn/knit/crochet related photos at least once a week. Perhaps I will begin the tradition tomorrow on Phiber Photo Phriday.